When you are presented with a construction design it is expected that every bit of the technical details will be hidden away by the finished room or space design. That means no unnecessary wires sticking out, nuts and nails in plain sight, and improperly covered flanges and panel edges. 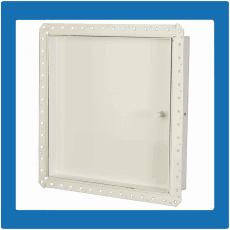 Getting to use an access door or panel makes it even more complicated. There needs to be a way to access pipes or wires behind the wall or ceiling without disrupting the design aesthetic put in place. The answer? Karp recessed access doors and panels. A recessed surface makes it easier to apply the same material on the door as the rest of the wall or ceiling around it. 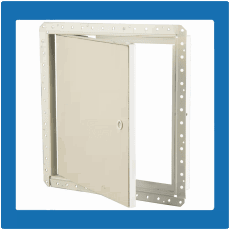 Whether it be an access door for tile or drywall, assimilating the surface to make it as concealed as possible is now easier than ever. There are even options for recessed fire-resistant ceiling doors and doors that have factory-installed drywall to match that which is already applied to the existing wall.